Hello Guys, today there's not gonna be any beating about the bush, as i'm just gonna go straight to the point, and tell y'all what we have for today. 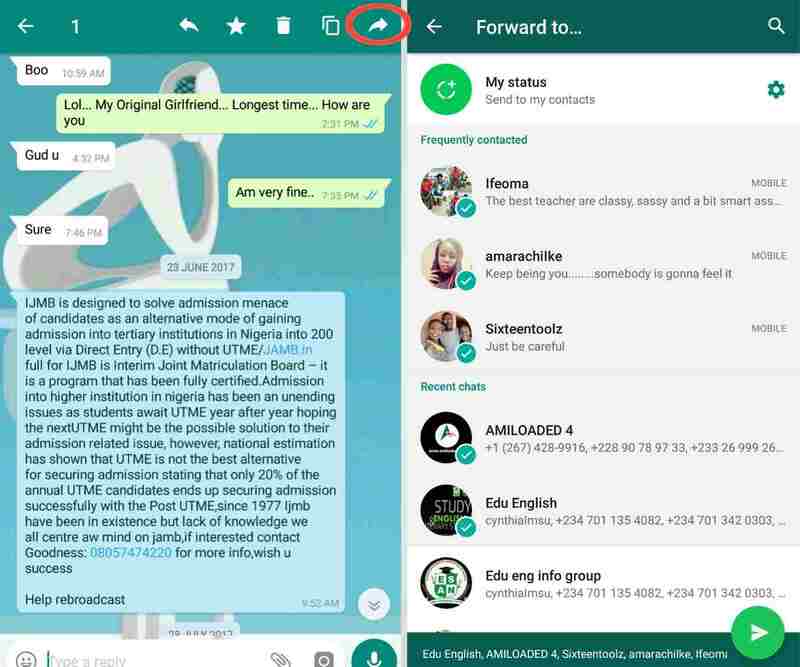 Today i'm gonna be sharing with you, some cool whatsapp tricks and cheats, though most of them might be old, but they sure do come in handy most of the time, and i bet you reading this, doesn't know about them, if not, you wouldn't be here up to this point. So, without wasting time, and to make things easy, here are the list of stuffs we'll be learning how to do on whatsapp today. Now those are the list we're gonna be working with today, and without further ado and ceremonies, let us get to the first one which is..
Like i said before, most of the tricks we'll be discussing here today, are pretty old, and this one here, is not an exception, but can come in handy though. 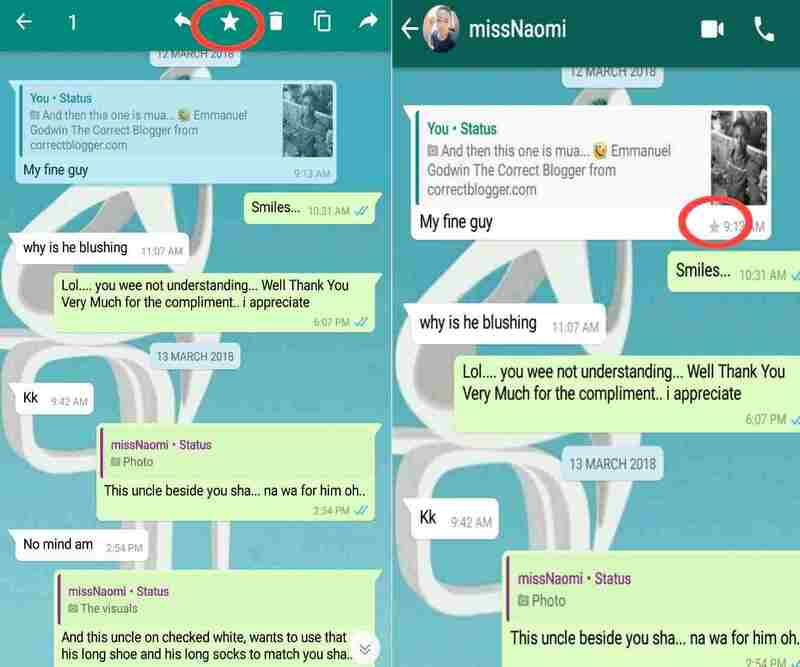 So the first one, changing font or type faces on whatsapp. 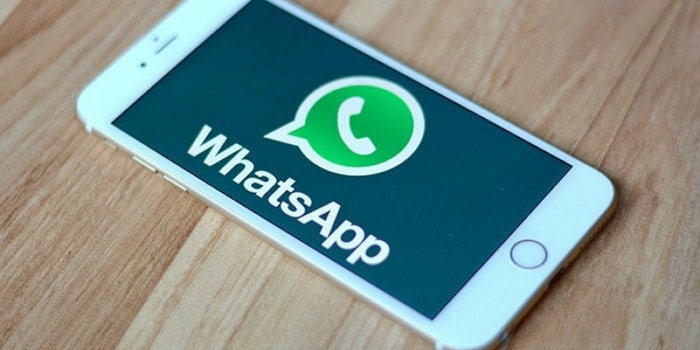 Right now and currently, there is just one font type that you can use on whatsapp apart from the normal default font that comes with all iOS or Android smart phones. And the font type is called the "Monospace Font, and it looks like this right here... ⬅️", doesn't look very important, but can be used when you feel like you want to look different from the rest. So here's how it is done, when writing a message to someone on the whatsapp instant messaging app, just place the text in between these symbols (```Your Text Enters Here```), and that is all, any text in between those symbols, three on the left, and three on the right, will be automatically changed to a Monospace. Cool right. STRIKE THROUGH. In this case, you can use any of these to emphasize more on your texts.. like this. 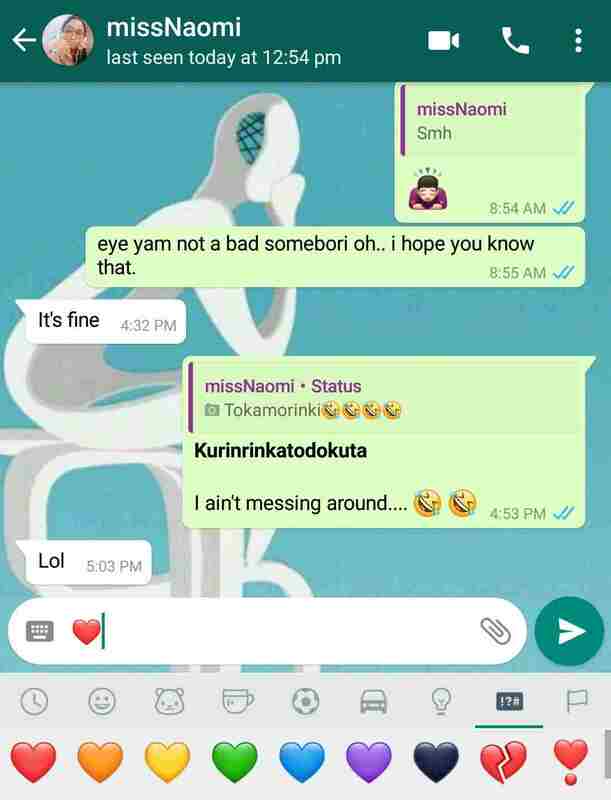 Now i'm pretty sure most people don't know or have not even heard of this one before, even me too, i never knew i could do such on whatsapp, but not until a few days ago. So how do we get this done? Now in this case, the process is pretty simple, clear and straightforward, you don't have to add anything, or minus anything. 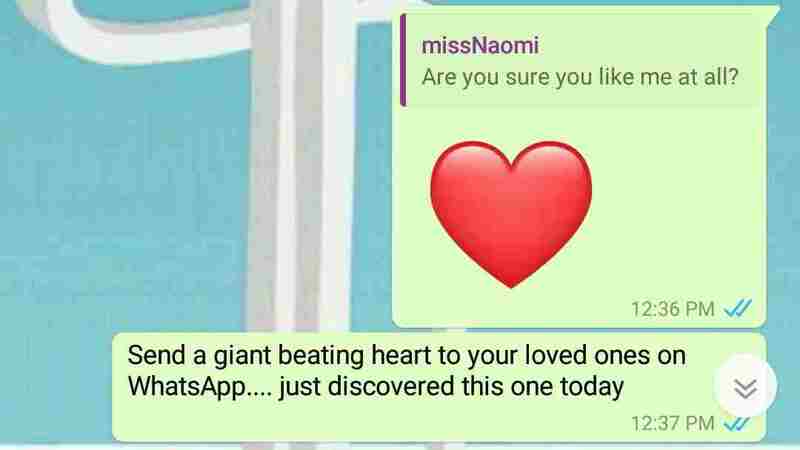 All you have to do, is go to whatsapp emoji lists in your device by tapping the little smiley head emoji icon, search for and select the Red Heart emoji, and send it to the person you're texting, like magic, you'll see the heart beating slowly, like this... Ahhh... very funny, sorry i can't show you the beating heart here, but i can always show you a screen shot. 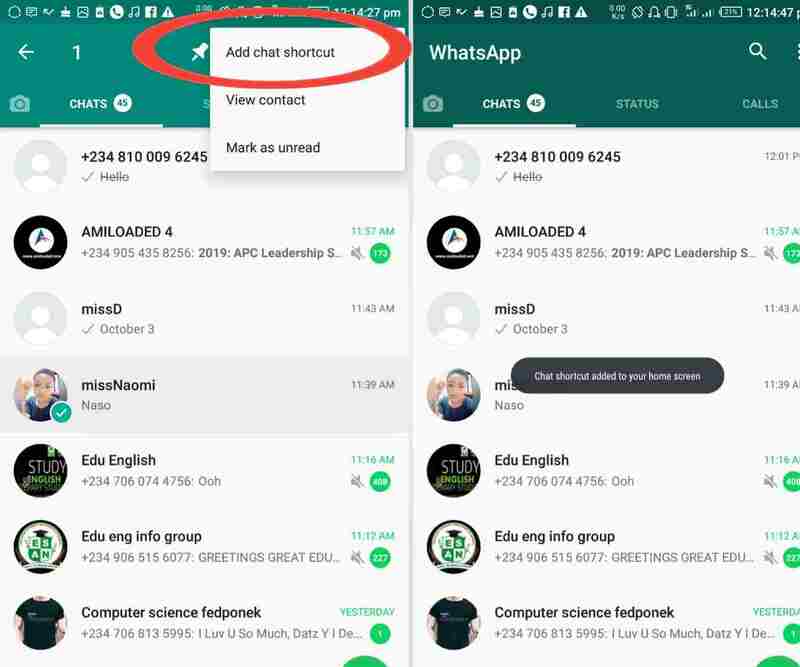 Now this one might not really seem important to most people, but just in case you feel like you want to see how far and how much you've used whatsApp all your life, then this might come in handy. 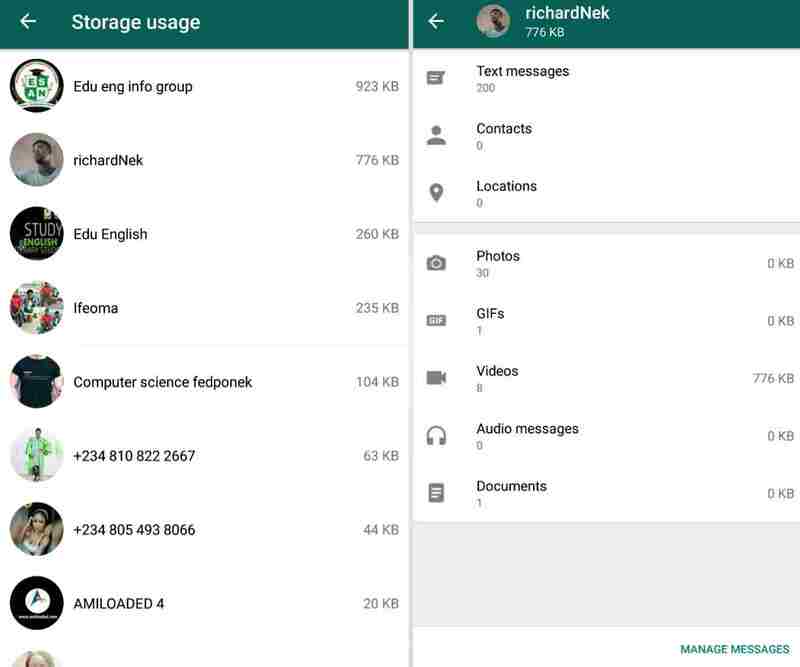 So first of all, on your WhatsApp home screen, tap on the three vertical dots at the top right hand corner of your device's screen, select settings, go to data and storage usage, select network storage, and you will be presented with a list of all the number of messages that you've sent and as well received on whatsApp, the amount of data they've consumed so far, as well as statistics for uploaded and view statues on WhatsApp, and many other information, which might be important to you. There's not much difference between this and the one above, only that in this case, you're able to narrow down the statistics to a single person. Maybe you found this new friend whom you've really been chatting with for a while now, and you felt like, okay lemme just see how far i've gone with him/her. 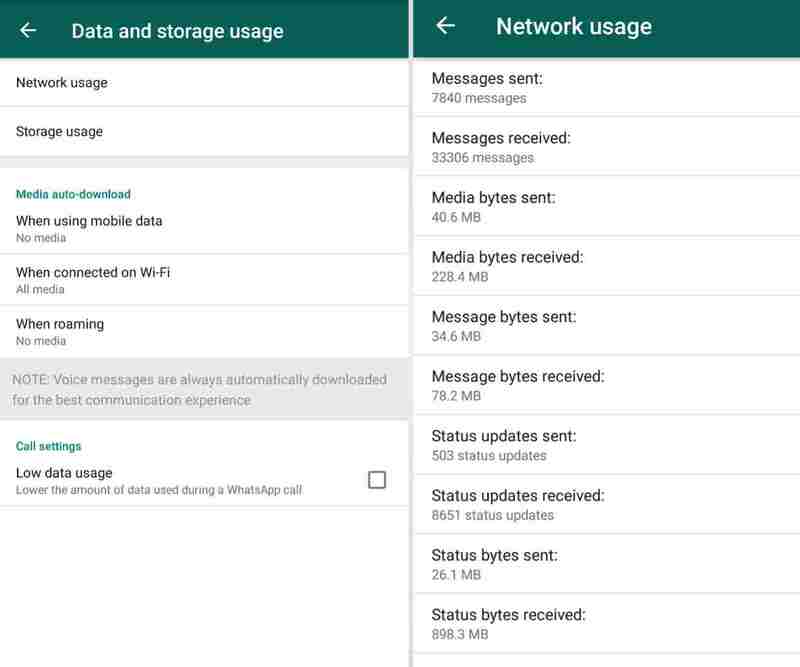 All you have to do is follow the same steps listed above, Settings >> Data and Storage Usage, but instead of selecting Network Usage, this time select Storage Usage. You will be given a list of all your contacts, with a quick highlight of data usage for each, tap on any of them, and you will be presented with a more detailed statistics of what you've been doing so far with them. Now when you mute a contact in your list, it simply means you wouldn't be notified when that person sends you a message. Its as pretty good as turning your phone to silent mode, but in this case, it is only directed to a single person or a group of persons, depending on the number of annoying fellows you have in your contacts list. And it doesn't necessarily have to be a person, you can as well mute a group chat, where there are a lot of messages entering into your phone every now and then, and you couldn't just help with the continuous sound of your phone bleeping every seconds, and probably making you look stupid in public, and as well draining the life out of your battery. So how do we get this done with? 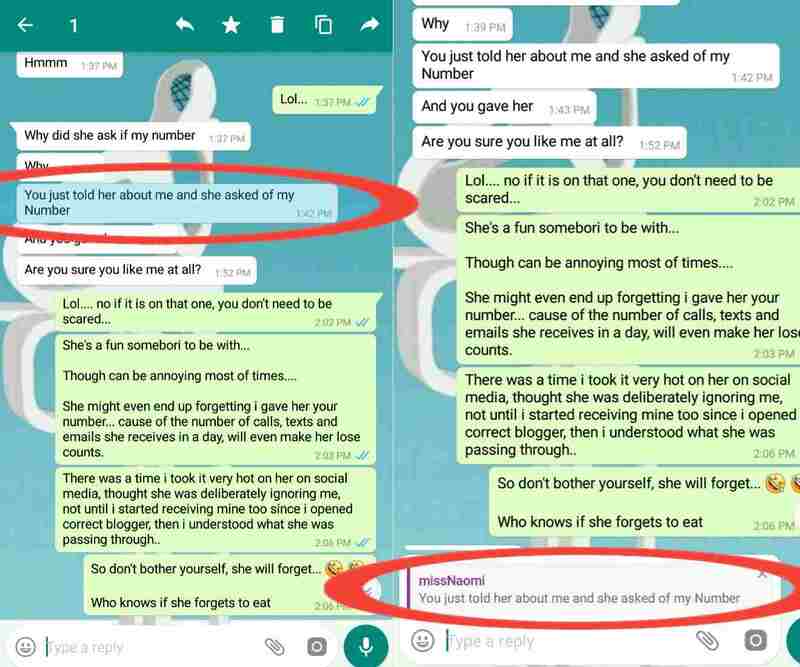 first of all, what you'll want to do is locate the contact, he/she should probably be at the very top of the list, because they're always the ones disturbing. 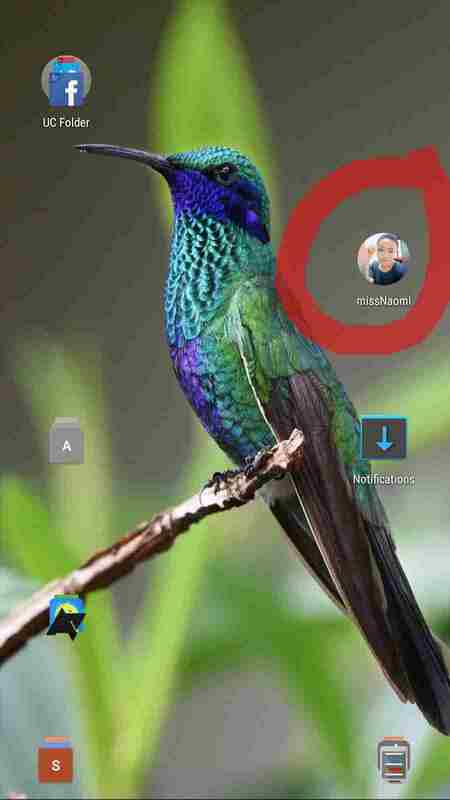 After locating him/her, tap and hold on the contact, a short pop-up menu will appear at the top right hand corner of your device's screen that looks like this. 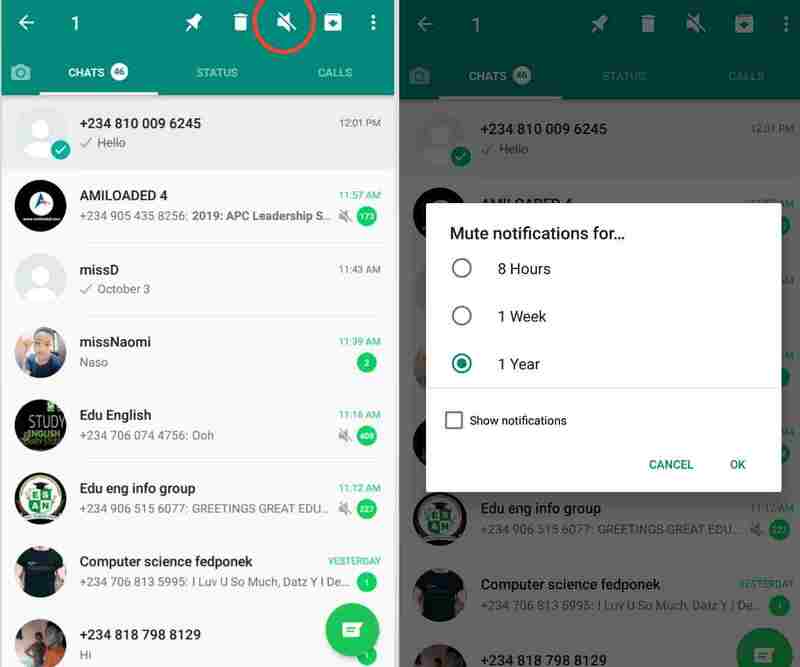 Select the "Mute" icon (it is the one at the middle of them all), it will give you three options to choose from for how long you want to mute them, select anyone of your choice, preferably for a year, if the person is that annoying, and select ok. Check the "Show Notifications" box if you still want to keep message notifications for the person, but your device still wouldn't make a noise. To see if a contact in your list is muted or not, all muted contacts will have the tiny grey colored mute icon in front of them. Cool Right. Now before i'll tell you how we can do this, i will like to tell you first how whatsapp contacts list works. 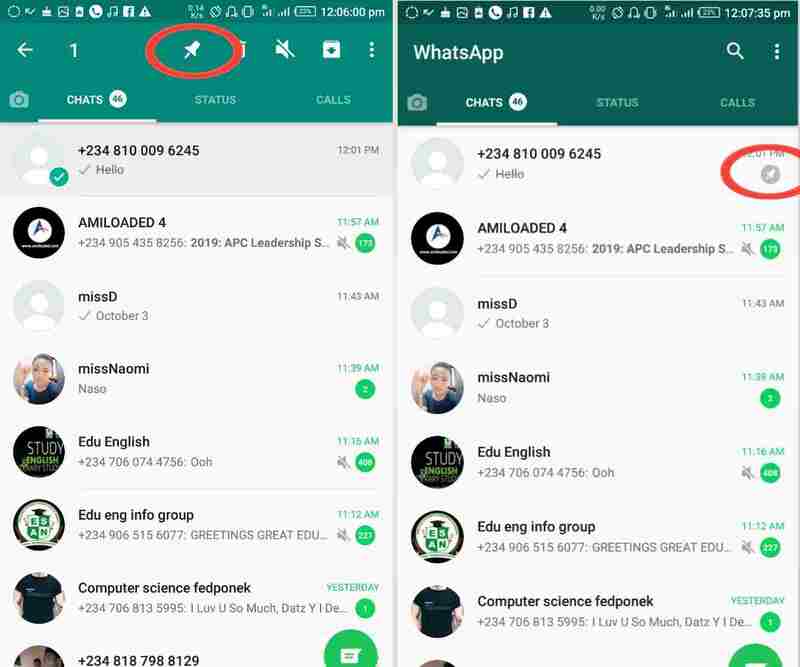 What you have to know is this, when you are always chatting or getting a lot of messages from a lot of people on your whatsapp, the most recently engaged contacts are moved to the top, while the rest are being pushed downwards with the less messages you get from them. So in case you have this special person in your life, who you wouldn't want to be pushed downwards automatically due to whatsapp algorithm, maybe you just want to keep them at the top, so you wouldn't easily forget talking to them, maybe at least once in a day or so, then all you have to do is pin him/her to the top of the list, like this 📍 and they will remain there, no matter what amount of recent messages comes into your phone. So how do we go about it? same steps from the last trick up there, Tap and Hold on the Contact You wish to pin, when the short horizontal quick menu appears, select the "Pin" icon, and you're done. All Pinned Contacts also have the little grey coloured pin icon in front of them. Now this feature is pretty handy, let's say someone sent you one of those inspirational stuffs that really broke your emotions, or let's say a really funny text that you would like to always get back to whenever you are feeling bored. All you have to do is star the particular message, so that even if the message disappears from easy reach due to your constant chatting and long threads of both sent and received messages between you and the person who sent it, you can always and easily get back to it, whenever and wherever you feel like, it only requires a simple exercise..
First of all, locate the particular message you wish to star (notice i didn't say contact this time around, i said message), tap and hold on it, and another quick horizontal menu will appear at the top right hand of your device's screen. select the star icon, and you're done. Multiple messages from the same contact can be marked and starred at once. 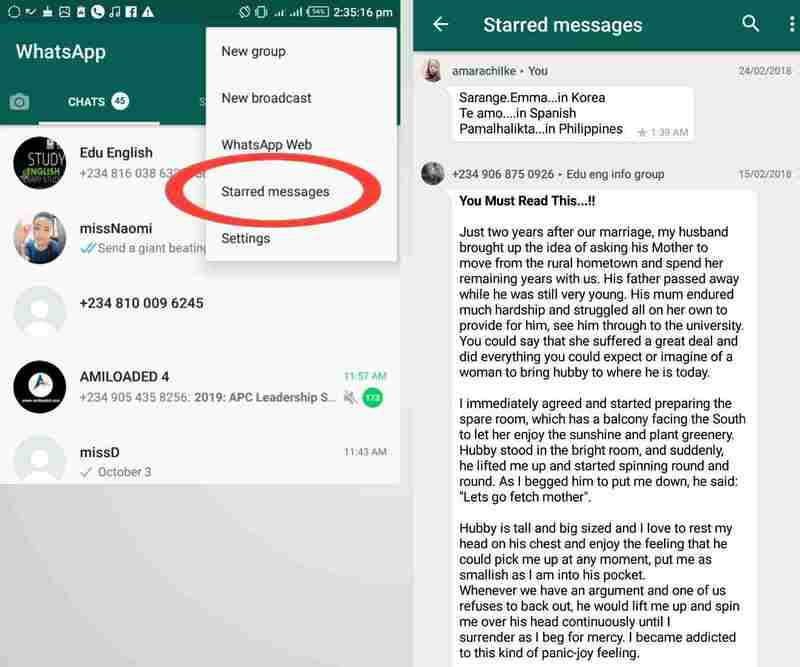 And to see a list of all your starred messages, Go back to your WhatsApp Main Menu screen, tap on the three vertical dots at the top right hand corner of your device's screen, select starred messages, and you'll be given a list of all your starred messages, from there, you can get back to anyone you wish to. Now this trick comes in handy especially when you're chatting in a group, and everyone is sending messages at once, for you not to get everyone confused as to whom your messages are or is being directed to, so that someone who doesn't have any business in it wouldn't see it as an opportunity to poke into some other people's businesses, you can fashion your messages so that everyone will know who it is being directed to, or the particular message that you're replying to. Note that it also works for individual chats too. So to get it done, all you have to do is tap and hold on the message you wish to reply, the same horizontal quick menu from the last trick will appear again, select the backward facing arrow, then type your reply and send it. Please Note - that you can't reply multiple messages at a time. Only one at a time. Now this comes in handy when you have that special someone, with whom you're always chatting with, so why not create a shortcut of that person and place him/her on your device's home screen, so you won't have to repeatedly go through all the stress of searching for that one special person from your numerous contacts, whenever you want to say hello to him/her. Like this. So all you have to do is; Locate that special somebody, tap and hold on the contact, tap on the three vertical dots at the top right hand corner of your device's screen, select Add Chat Shortcut, and that is all, that special someone is now a step closer to your reach. Let's say, you sent a text to someone last night, and was expecting to see his/her reply when you awake the next morning. Morning came quickly, you woke up, grabbed your phone to see if the person has replied, on getting there, the ticks has turned blue to show that they have read it, but you didn't get any reply, and you were probably wondering when he/she saw and read your message but didn't reply, or maybe he just saw and read it now, and he's gonna reply any moment from now. Well stop wondering and use this simple but handy feature, to know if the person was really ignoring you on purpose. All you have to do is tap and hold on the message which you sent to them, remember our quick horizontal menu options? they will appear again, and this time, select the circled "i" icon ℹ️, and immediately, you will be presented with the time the message was delivered to him/her, and as well as the time he/she read it. With that you can make your decisions concerning the ignorant fellow.. Okay, if you are one of those ignorant fellows i mentioned above, you just like reading someone's message, and don't like replying back to them, and then eventually you keep getting caught because of the last trick up there. Well this is for you, now you can read someone's message without the ticks turning blue on the sender's phone to show that you've read their messages. How do we get it done? All you have to is pretty simple, when a message comes into your device, don't just run ahead of your shadow and open it, first of all, turn off your mobile data, and switch your device to flight mode ✈. Now you can open the message and read it, and the person wouldn't know whether or not you've read their messages... Cool right? Sense will not kill me. Tap and hold on the message, once again, our quick horizontal menu options comes in to play again. Now select the right or forward facing around to forward the message, a list of all your contacts will appear to you in order of when last you've talked to them, select as many as possible you want to forward the message to, and press send. The message will be sent to everyone of them at once. Now this feature is slightly related to the one above, cause we are still talking about sending a single message to very plenty people at once. But in this case, we are not copying anyone's message. Lets say you want to make a general announcement to a very large group of people who are not really related by any means. 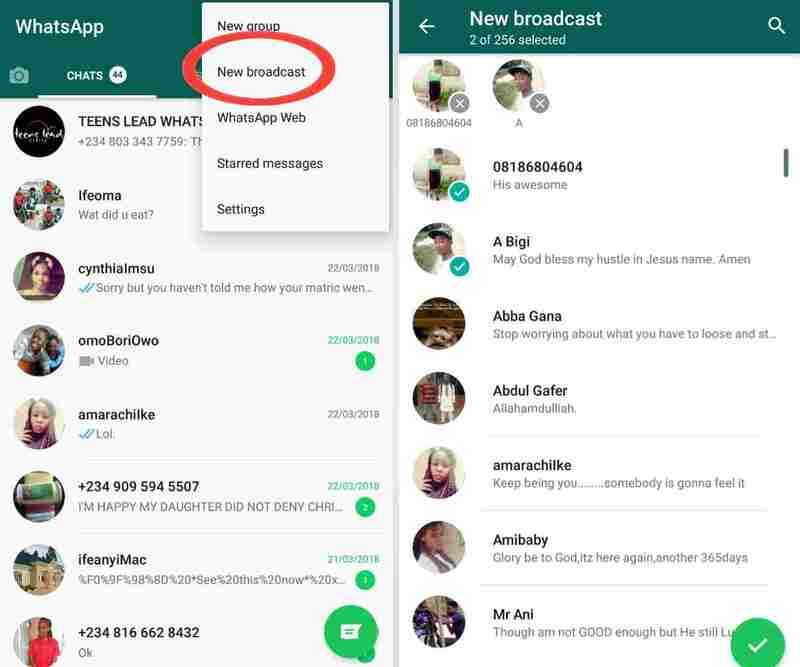 So instead of creating a WhatsApp group, you can simply use the broadcast feature provided in whatsapp. So lets get this done with, first of all, tap the three vertical dots at the top right hand corner provided in whatsapp home screen, select New Broadcast, next you will be presented with a list of your contacts on WhatsApp, select the persons you want to send the message to, after selection press the Green Check button at the bottom right corner of your device's screen, and then you'll be launched to a page where you can type your message, and then send. 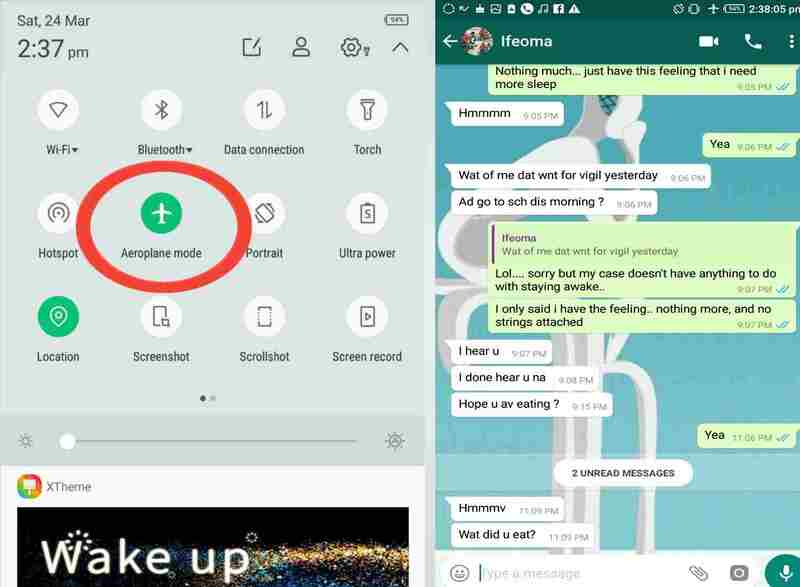 As easy as breeze..
Just take the recent chats widget as a quick shortcut to read all incoming messages without opening the WhatsApp app itself, which means saving your phone a reasonable amount of RAM space, and maybe battery as well. All you have to do is go to your device home screen this time (noticed i didn't say whatsapp home screen), long press on any empty space on the home screen, a list of options will be shown to you, select the widgets option, search through the widgets shown to you, until you see the one labeled just "WhatsApp", hold and drag it to your device's home screen, and that is it. All recent chats and unread messages will be shown to you there, which makes it another great way to read messages without the sender knowing. Cool stuff right? And as for the last, and not the least, we have the.. This feature can really come in handy, when you're giving out your phone to someone, and you know there's gonna be a ton of confidential messages coming in at that time, which you wouldn't want to leak to anyone. 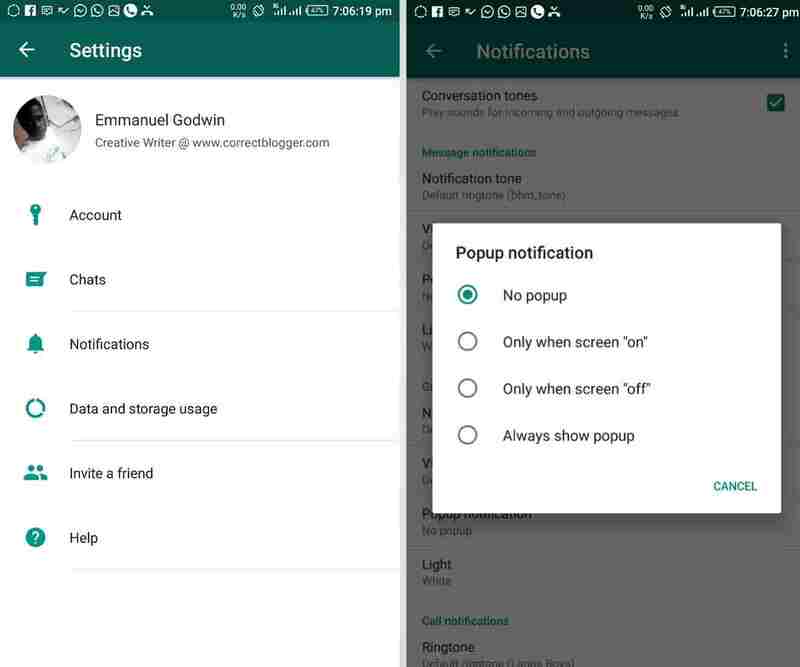 All you have to do is block whatsapp pop-up notifications, so the phone only bleeps, but doesn't show who the message is coming from, or what it is all about.. So to get it done, all you have to do is as usual, click the three vertical dots icon from the same position you've been doing before, select settings, go to notifications, go to pop-up notifications, and choose how you want your pop-up to look like. 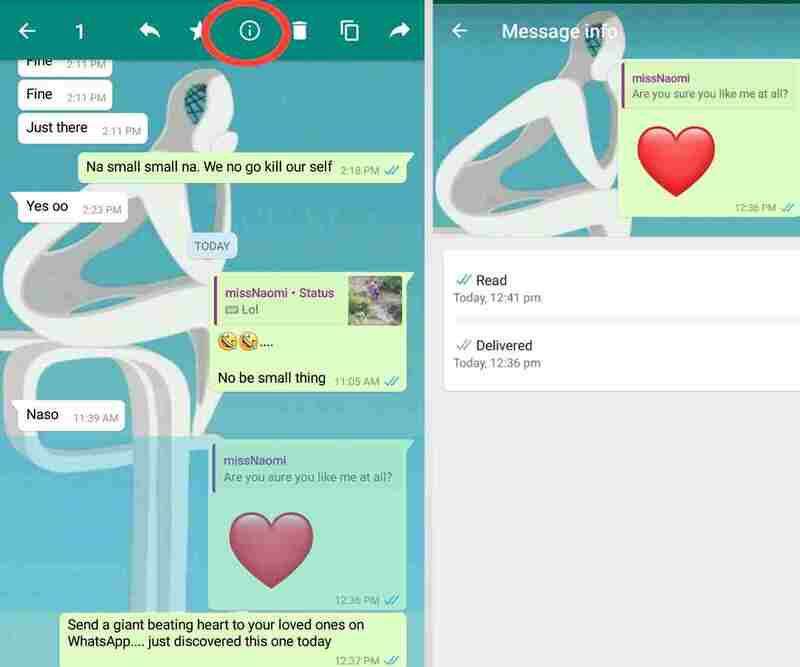 First of all, i want to say a very big congratulations to those who made it to this very point, because i will be revealing the bonus trick to you, on how to read messages on WhatsApp, even when they been deleted already. But on one condition. If i can get up to a 100 shares, plus some positive comments from this article, asking me to go ahead, then i'll write a well detailed article on that. So if you interested in it, it doesn't take anything to share a wonderful piece like this one. So just share it, and tell us in the comments box if you want it or not, and abive all that, make sure you subscribe to our newsletter, so you'll be notified when we drop it. Thanks Bro.. i'm glad you loved it.